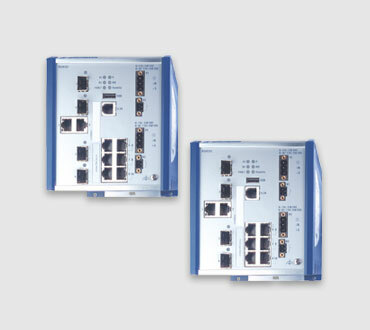 RSR series switches are available with optional gigabit ports and an extended temperature range of -40C to + 85C. Ultra-fast ring recovery times under 10 ms are possible using HiPer-Ring redundancy protocol and the switch's robust metal housing offers extended RFI/EMI and vibration immunity. The RSR switches go above and beyond the already rugged capabilities of Hirschmann's switches by being extremely immune to noise and able to provide maximum uptime in extreme environmental conditions. Hardened - The rugged RSR switches deliver the performance you need even under rough conditions, i.e. shock, vibration and temperatures fluctuating between â€, 40C and + 85C. Hirschmann Rail Switches are built to take the punishment in power generation and distribution, marine, rail, road and other transportation automation applications including fiber optic rail networks, train station passenger information systems, conveyors and airport runway lights. Flexibility - 19 versions can be configured individually with up to 26 ports including up to 3 Gigabit Ethernet ports and individually configurable uplink ports. Wide Range of Input Power Options - Allowing flexibility of power supply, the RSR switches can be configured with wide-voltage power supplies from 16.8-60VDC or 48-320 VDC and 90 â€, 265 VAC with no need for an external power supply.